Emma Lyon was born into a humble family in Chester (1875). A beautiful young woman, she went to live in London, where she became a model for a number of artists, one of whom was George Romney. 1791: Emma married Sir William Hamilton, British Ambassador to the Kingdom of Naples. 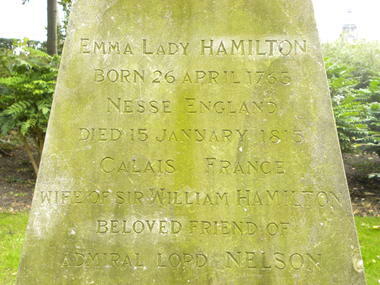 1793: Having become a friend of Queen Maria Carolina of Naples, Emma met Nelson at the royal court. Sir William, now advanced in years, did not appear to be unduly upset about the relationship. 1805: Nelson died during the Battle of Trafalgar. 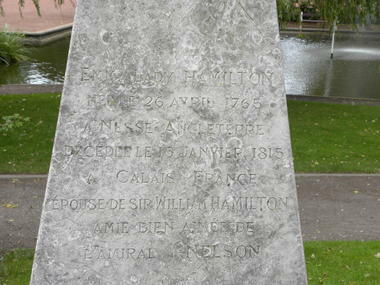 Lady Hamilton quickly spent the inheritance left to her by Sir William. In his will, Nelson had requested that “Lady Hamilton be left in the care of the King and the country” and had made provision for her to receive an annual allowance. But Lady Hamilton, now without any protectors, received nothing and the money went to the legitimate Lady Nelson. July 1814: Heavily in debt, Emma fled to France with her daughter to escape her creditors. She lived in an attic in Calais, ending her days in poverty (and possibly as an alcoholic). She was forced to sell everything left to her by Nelson to pay off her debts in France. 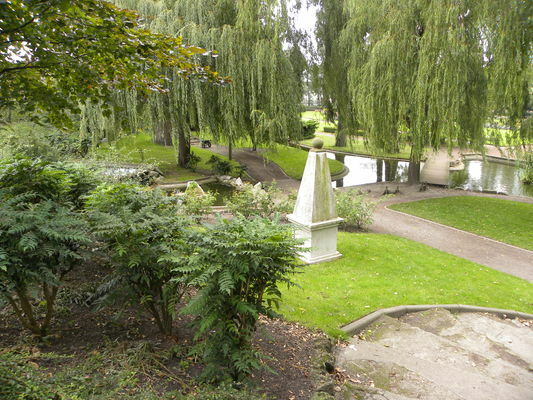 January 1815: Emma died and was buried in the cemetery (where the theatre now stands). Her grave, however, was not found when the cemetery was moved in 1871. The house where she died (in the Rue Française) was destroyed by WWII air strikes. 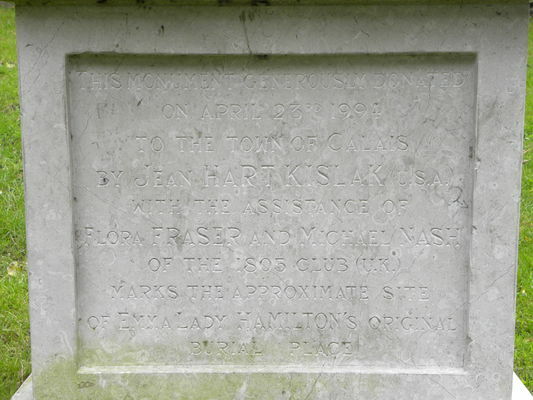 A commemorative plaque was placed on the site in 1958. Although the majority of French people know little about Lady Hamilton, her story is well documented in the arts. In 1941, the film “That Hamilton Woman”, starring Vivian Leigh and Laurence Olivier, was released, whilst in France, Alexandre Dumas (père) wrote his novel “Lady Hamilton” in 1865. There is no review about Lady Hamilton, be the first to leave one !